The location of this ACE store is in the Upland Village Shopping Center, just south of Upland Plaza Apartments at the corner of N San Antonio Ave. and W Holt Blvd. We have a walk-in space with a reception area and plenty of free parking spaces. Customers can conduct transactions such as bill pay and check cashing at this location. Omnibus’ Bus line #61 has a stop conveniently located near the store at the corner of Holt and San Antonio. Hungry? This ACE location neighbors a variety of restaurants including El Pollo Loco, Panda Wok, Little Caesars, and Subway. If you’re running errands, the area is also a hub for the needs of your daily life, with Slater Bros. Market, Sprint, Carquest Auto Parts, Susys Kloset, and Men’s & Kid’s Fashion right in the vicinity. Upland residents that give an auto title loan powered by LoanMart a try may get approved for $30,0001 in financial assistance in as little as one business day3. Auto title loans powered by LoanMart use the title to a vehicle to secure funds. Upland residents can find out everything they need to know about auto title loans powered by LoanMart below! Apply for LoanMart Auto Title Loans in Upland! Regardless of credit score, Upland residents could apply and see if they qualify for an auto title loan powered by LoanMart for free! Plus, there’s no obligation to continue with it, even if resident does qualify for one. That means Upland Residents have the benefit of making educated decisions free of charge. Possibility of refinancing an existing auto title loan from another lender if one meets requirements. Prepay your auto title loan and incur zero fees or penalties5. Competitive rates and ongoing customer service! How to Apply for Auto Title Loans Powered by LoanMart in Upland! Call the toll-free line and discuss an auto title loan powered by LoanMart with an agent directly. Click Chat Now for a live chat with an agent. 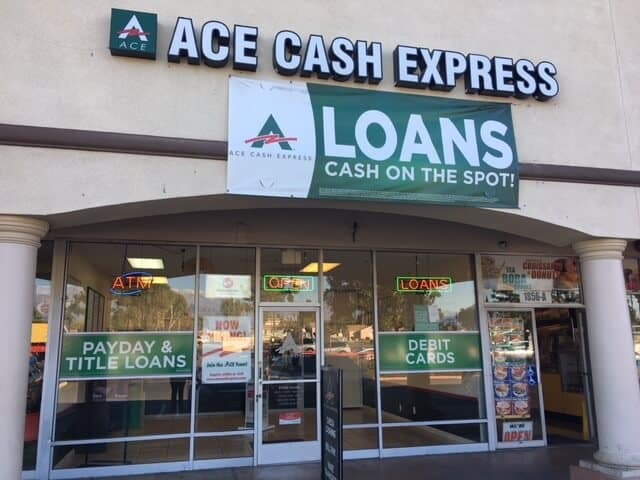 Enter an ACE Cash Express to find out more about title loans powered by LoanMart. Once approved, a skilled representative will chat with you about the title loan process and how to obtain your funding!